We’d love your help. Let us know what’s wrong with this preview of The Night Before Christmas by Kelly Hunter. To ask other readers questions about The Night Before Christmas, please sign up. 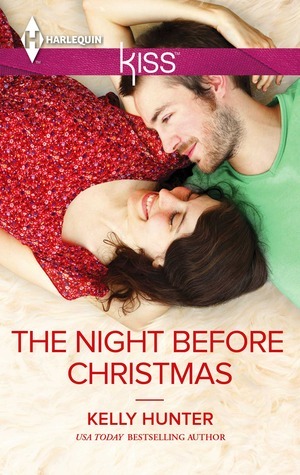 "The Night Before Christmas" is the story of Jess and Boyd. Basically, a very short filler story which has a second chance romance between two lovers that were separated by circumstances, and who reunite on a bittersweet Xmas eve, only to realize their feelings never died down. Sweet in some parts, confusing in others but mostly incomplete. Mostly, was an introduction to the series and its characters. This was a highly enjoyable Christmas novella. Short but sweet with a bit of a steamy ending. As it says in the summary above, this Christmas novella is a prequel to Kelly Hunter's "What the Bride Didn't Know." Jess and Boyd were best friends from childhood until high school, and fell in love when they were teenagers. Boyd, however, broke up with Jess during their senior year in high school. Now, as adults, they are both back home and attending a fancy Christmas party at the West home with old friends Jared, Trig, and Lena. Is the love still there? Can Jess forgive him for walking away f As it says in the summary above, this Christmas novella is a prequel to Kelly Hunter's "What the Bride Didn't Know." Jess and Boyd were best friends from childhood until high school, and fell in love when they were teenagers. Boyd, however, broke up with Jess during their senior year in high school. Now, as adults, they are both back home and attending a fancy Christmas party at the West home with old friends Jared, Trig, and Lena. Is the love still there? Can Jess forgive him for walking away from their friendship? I loved the sections of this novella that had to do with the romance between Jess and Boyd. Their reunion, love, and real friendship jumped out of the pages and was satisfying enough, but too short. Why? Well, this short novella is divided between their romance and sections dedicated to young versions of Jared, Trig, and Lena, and although it is cute to read about them 'then,' their section was not meaty enough to keep my interest, and it took the much needed focus away from Jess and Boyd. Regardless, a cute Christmas novella. Hardworking and independent Jess Turner has come home from the bustle of Sydney to enjoy a quiet Christmas. But after running into an old school friend, she finds herself talked into attending a lavish Christmas Eve party--and running straight into the only man to ever break her heart. A Christmas hopeful short story. 4 stars. I seriously hope I didn't pay money for this one. Jess comes home and runs into old friend,Trig, who invites her to a Christmas Eve party. There she runs into friends Jared and Lena. They get Trig, who asks if she's seen Boyd. While it's never really explained to any degree how Boyd broke her heart, they end up going off together, confessing their love, and I guess live happily ever after. Either the author was drunk when she wrote it or she did it in her sleep because it truly made no sense and I seriously hope I didn't pay money for this one. Jess comes home and runs into old friend,Trig, who invites her to a Christmas Eve party. There she runs into friends Jared and Lena. They get Trig, who asks if she's seen Boyd. While it's never really explained to any degree how Boyd broke her heart, they end up going off together, confessing their love, and I guess live happily ever after. A quick novella about separated lovers meeting after four years. Jess and Boyd obviously bonded together as abused children, but Jess left her hometown to become a physiotherapist, and he pursued a successful career as a Motocross rider. Reuniting at a Christmas party, it's as though the years melt away. These two are meant for each other, siiigh. Australian born Kelly Hunter is a three time Romance Writers of America Rita finalist, a USA Today Bestselling author and loves writing to the demands of the short category romance form.